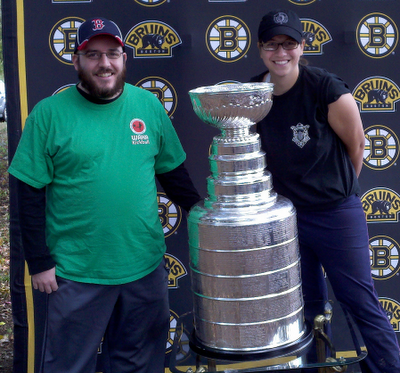 Jeff and his wife with the Stanley Cup - go Bruins! Tomorrow evening marks the start of the Stanley Cup playoffs, the prize for the best team in professional hockey in North America. If you're into competitive anything, there's little like playoff hockey - it's 60 minutes of fast, fast sport, and it will likely take some years off your life. A number of people, however, don't know quite how historic the Cup truly is, though. There's a lot of history and tradition with the Stanley Cup, and it might just be enough to get you interested for the next few months of playoff hockey. In the 1890s, the Governor General of Canada, Lord Stanley decided to create an award for the best amateur hockey team in Canada. He set up a series of rules, most notably that each team would have their names engraved on the Cup and that the Cup would travel from winning team to winning team every year, as opposed to issuing a new Cup annually. The first tournament was in 1893, and the Cup traveled through a number of different Canadian leagues until the NHL was the only professional league left standing in the 1920s. The Cup has been awarded every year since it's creation save for the 1919 flu pandemic and the 2005 NHL lockout. The Montreal Canadiens (boo!) have won the Cup the most times, in part due to their dominance but also as one of the "Original Six" NHL teams, which includes my Bruins. The original original Cup is now on display at the Hockey Hall of Fame, with a replica bowl being offered since the 1970s - the engravings on the Cup itself, however, remain original. When the Cup became full of names a few years ago, they began adding new rings to it and sending the oldest rings to the Hall of Fame. The traditions around the Cup are also rather onerous. It's basically understood that you do not touch the Cup unless you've won it, although that's not always followed (I totally touched the Cup), but if you do touch it, you DEFINITELY don't hold it over your head. The team captain always gets to hold it up first when the Cup is won, however, and it's then passed along to each teammate. A more recent tradition is that every player on the winning squad gets to take the Cup for a day - sometimes it goes to a community event, sometimes it ends up in the bottom of a swimming pool or becomes the bowl for a Kentucky Derby-winning horse to eat out of. The Stanley Cup is the most historic award in sports, and one of my all time favorites. I hope you give the playoffs a shot this year - it'll be worth your time.